There's a strain in the fiber of the Lewis family after the death of Gillian. David is struggling with the loss of his love and the challenge of bringing up fifteen year-old daughter Rachel. Returning to their island beach house for the summer, the Lewis are joined by Gillian's sister Esther and her husband Paul Wheeler. The Wheelers unexpectedly bring along lady friend Kevin Dollof in an attempt to break David free from the all-too-real memories of Gillian. A very romantic and sentimental film, To Gillian on Her 37th Birthday contains a lot of well etched humor. The childless Wheelers peck away at an acid marriage. Esther feels Rachel would be better off living with her for a while, and David is not exactly thrilled by the idea. Neither is anyone else at the beach house on the anniversary weekend of Gillian's death. Michael Pressman directs with a relaxed rhythm despite the building tensions. There some very touching person to person scenes. I think the sentiment is not overdone. And the characters are interesting to be around for almost two hours. There's one amazing scene between Esther and David. Kathy Baker really smokes as Esther. On the flip side, there's a scene between Paul and Rachel's friend Cindy that is, is patently false. 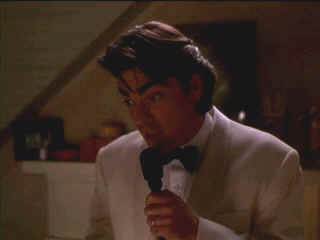 Peter Gallagher is a solid presence as David. He finds a good mixture of confusion and uncertainty through the unsteady sandy scenes. Kathy Baker is a consistently fine presence in the films she graces. A solid citizen performer, she is seldom flashy but always convincing. Her Esther has great strength and is grounded in reality. Clare Danes is a charming Rachel. She and Freddie Prinze, Jr. have some nice moments together exploring a summer romance. Bruce Altman delivers his lines with crisp intelligence. Michelle Pfieffer has some glowing moments as Gillian. It's a winsome production. The charm of Nantucket is captured by Tim Suhrstedt's warm cinematography. James Horner's score is very romantic and effective. It doesn't turn saccharine. David may display the best sand castle I ever saw, and with him buried as King, it's inspired humor. The final sentimental finish does carry on for a few too many beats. There are some shots that appear cropped on this 1.33 transfer, but overall the composition do not appear compromised nor does the transfer suffer from obvious zooming. The image is slightly soft in a few scenes but it looks good most of the time. Black levels are excellent. Night scenes are lovely with excellent depth. Shadow detail is very good. Source elements are clean. Lot output is powerful bringing gloss to the image. All those sunny beach scenes feel hot. Wonderful saturation and detail in the sand sculpture contest. The flags are awesome. Fleshtones have a natural range. Good color saturation adds fine dimension to the look. Check out the wonderful color resolution of the blouses and shirts and fabrics. Details are finely resolved. No evidence of high peak transition ringing. The music is recorded with good air and openess. Surround on the Dolby Digital 2.0 is nicely matrixed. Sophia mi Amore: That's what I thought the first time I saw one of the screen's sexiest women in Boy on a Dolphin. Maybe not in those words, but you get the idea. For a look a Sophia's career from one perspective, click on her image. Includes a selection of posters from her movies.